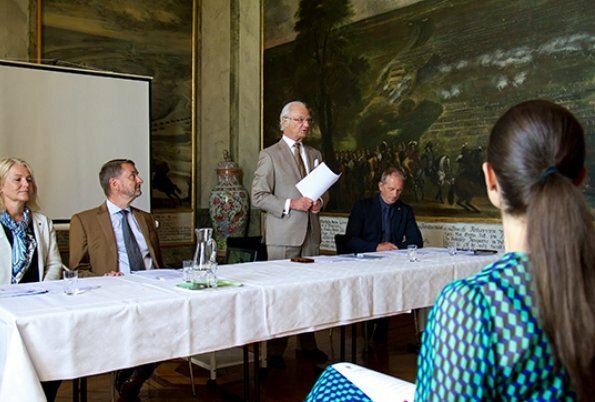 On May 31, King Carl Gustaf and Crown Princess Victoria attended WWF's annual meeting at Drottningholm Castle in Stockholm. Then, the King and the Crown Princess attended a lunch at Karamellan restaurant. The World Wide Fund for Nature (WWF) is an international non-governmental organization founded in 1961, working in the field of the wilderness preservation, and the reduction of human impact on the environment. What happen? normally so nice. 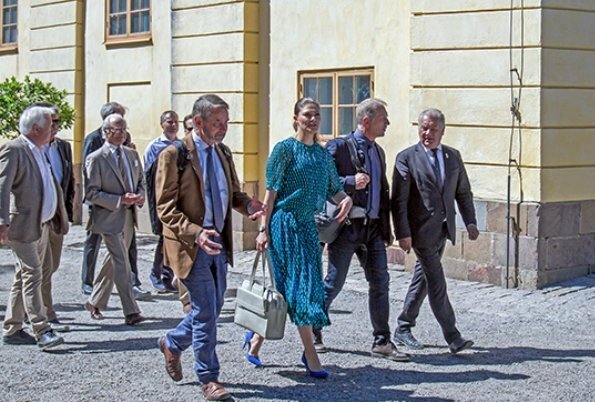 Crown Princess Victoria looks just lovely in this outfit! The colors flatter her, the shoes go nicely with it, and her loose hair accents the free-flowing feel to it. It is a very feminine look but goes well with doing business. And I don't think it is "matronly" at all. Agree. I like it too. Yes I like it! cannot see anything wrong. Much better than some others seen recently. Agree, CP Victoria is looking lovely. I like it as well. She is perfect. Very nice look. Love the shoes and handbag. Love it. Imagine this outfit in motion. You can have liveliness through colours and pattern - or you can have it through the flowing material itself. Having both is often too much. I like it too. But a bit unflattering in the hiparea. I do love that the shoes coordinate beautifully with the colors of the dress, and I love the flowiness...I think the problem for me is the dropped waist. That is a very difficult design feature for any woman to wear successfully. I think you´ve analysed it perfectly. The style is not the problem, it´s the proportions. The skirt needed to sit at her actual waist and ideally be defined by a belt rather than the tied ribbon. The skirt would then be knee-length or just under, instead of hitting her mid-calf which rarely is flattering. I would have gone a totally different route though and used these two pieces as separates. The top would have worked really well with a pair of white jeans. The skirt had looked nice with a white tank top (and flats and a straw hat). The two pieces together need to sit right or they will look like a sack, both because the are so floaty with next to no structure, and because the pattern is almost too much in this all-over print. Not sure the shoes were the best choice either (both colour-wise and style-wise). And lastly, that is one large bag, bordering on luggage. The king looks great. He is a very good dresser, usually looks impeccable. Agree! I never understood why designer created this dropped waist. Does it not make the legs look shorter than they are? And are not long legs the ideal? Weird. Nevertheless I like this outfit on Victoria. I think it is appropriate for this event. The color looks pretty on her and the shoes coordinate nicely. So glad her hair is not in that bun, but wish she would let her hair down. Wish her hair was not usually in a bun like Queen Margrethe or Anne, the Princess Royal. Her own mother is such a better example of nicely styled hair. Like the dress - why not. But her hair is so unflattering. Is there no proper hairstyle for her? Impossible. Why doesn’t CP Victoria seek fashion and hairstyle advice from her mother? Not my style but she can carry it of. Good for her. I am very impressed with commitments of King Carl Gustaf and Princess Vitoria of Sweden to conservations. The British Royal family is also committed to conservation. Two colours that should look great together, yet... no! I don't know why but this doesn't work for me at all.